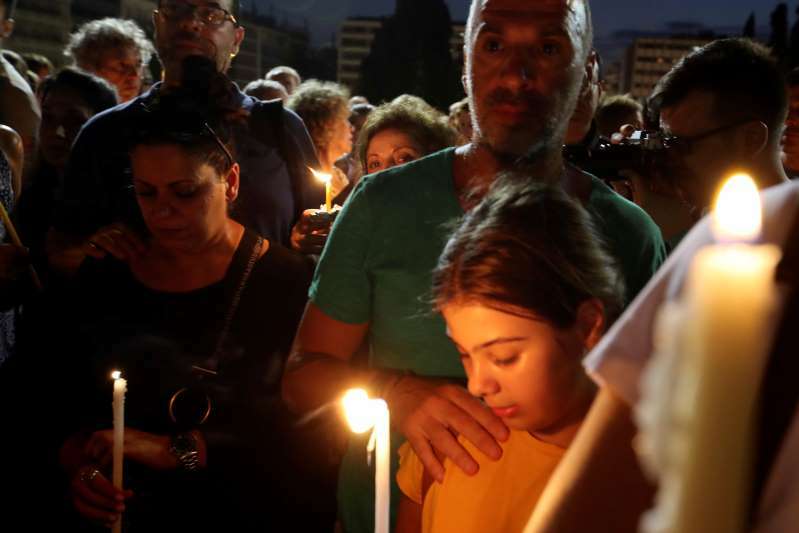 People gather with candles outside the Greek Parliament in Athens on July 30, 2018, as they honor the wildfire victims. Authorities say the bodies of 70 people killed by Greece's deadliest wildfire in decades have been identified, while forensic experts continue working to identify more remains recovered from the area. The coast guard said Tuesday it had recovered the body of a woman from the sea in the Saronic Gulf south of Athens, but tests were needed to determine whether it was related to the July 23 blaze that devastated a seaside resort northeast of Athens. Some 90 people are believed to have died in the blaze, but confusion has surrounded the exact death toll. The fire department explained some bodies were so badly burned that coroners discovered some body bags contained remains of more than one person, raising doubts about the total number of bodies recovered.